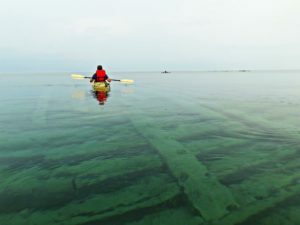 Paddling the Albany shipwreck in a sea kayak. Photo courtesy, Bob Grochowski. When you venture out on Lake Huron to view the shallow shipwrecks of Thunder Bay National Marine Sanctuary, we want you to be safe. The Great Lakes behave more like an ocean than a lake. Changes in wind direction, incoming weather, and special equipment needs are all important things to consider before leaving land. Check out these handy references to help you with your journey.